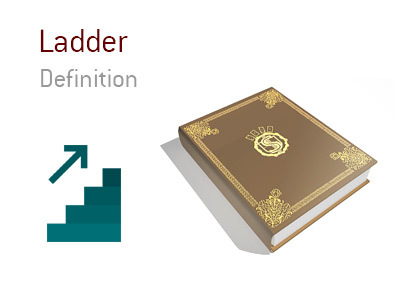 What does the term "ladder" mean in the world of poker? What is the definition of the term "laddering" in the poker world? When you are playing tournament poker, "laddering" means that you are moving from one pay jump to the next. For instance - let's say that you are playing in a $100 buy-in No Limit Hold'em tournament online. The top 100 spots pay out. The #91-100 finishers will receive $130, while the #81-90 finishers will receive $170. Let's say that there are currently 91 players left in the tournament. Somebody busts out, which means that there are now just 90 players left. This means that everybody left in the tournament has "laddered", as they have all moved up in terms of their payout. Prior to the player busting out, everybody left in the tournament was guaranteed a payday of at least $130 - now, with somebody hitting the rail in 91st place, all 90 of the remaining players in the tournament are guaranteed a payday of at least $170. For each pay jump, this is said to be another "ladder", as the remaining players continue to move up in terms of payouts.